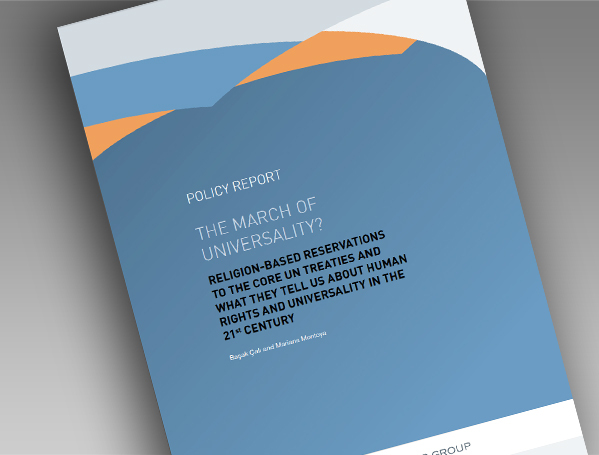 URG’s new Policy Report on ‘The march of universality?’ by Başak Çalı and Mariana Montoya presents the findings of a two-year project to map and analyse the implications of all reservations to the core human rights conventions, and to better understand the extent and nature of these key checks on the universality of human rights. As part of the project, the URG was particularly interested in identifying and analysing reservations that are – or appear to be – motivated by doubts, on the part of the reserving State, as to the compatibility of the treaty in question with certain religious or belief systems. The practice of entering reservations to the UN human rights treaties raises crucial questions about the universality of human rights and, conversely, about cultural and religious relativism. A desire to win this argument – to demonstrate the inalienable and universal nature of human rights – explains the strong opposition, amongst many State officials, UN experts, NGO representatives and academics, to reservations to the international human rights treaties. However, another reading of reservations is that they can be a useful political tool – a means through which States can demonstrate their commitment to human rights by acceding to a treaty even where they may face strong domestic opposition to some of the treaty’s individual provisions.